All aboard! Misery this delicious loves company. 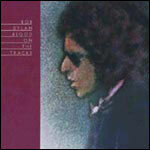 It’s strange, really, how Bob’s blues can provide such toe-tapping fun. Maybe that is part of the album’s enticing and everlasting charm. Whether you need a friend to commiserate with during your own hard times, or you simply feel like meandering through a plush landscape of magnificent melodies and gorgeous imagery, it’s entirely up to you. The tracks are laid. It is an epic, tangled-up journey into blue. Perhaps it’s also a bit ironic that an album so helplessly lodged in the depths of despair begins with the sun shining because sunshine isn’t going to help here. No, here the forecast not only calls for pain, but calls for the kind of pain that lasts a lifetime. Did you think for one second that this was going to be a walk in the park? That giving your heart over to love didn’t carry with it, an inherent grave risk? There’s blood on the tracks for goodness sake! To love is to lose. Big ol’ chunks of yourself are ripped out, gone forever. And that’s on a good day. The mourning continues. The darkness endures. There was no avoiding it. Such is the choice—is it a choice?—we make. You can close your eyes and try and pretend that things are okay, that you are somehow stronger because of it. And maybe you are. Who really knows anymore? The only certainty now is the gaping hole—no longer a crack—from which the past has no choice but to gush free and easy while you are forced to pretend it doesn’t exist at all, or at least to pretend it doesn’t sting nearly so bad.